For the ninth issue in our super Christmas gift guide series, we are turning our attention to our green-fingered friends and family members! If you’re struggling to find a present worthy of your garden-loving grandma, then look no further that the funky products below for keeping your resident horticulturalist happy. From funky watering cans to brilliant bird feeders, we have more gifts for gardeners than you can shake a stick of festive rock at! Our quirky collection also includes gifts which will help keen gardeners bring their passion for gardening inside in these cold winter months – including an indoor green house and watering can! Check out the selection below, or click here to view the whole range of gifts for gardeners! These adorably whimsical creations are a brilliant way for keen gardeners to bring their passion for plants indoors! These innovative designs emulate natural rainfall, meaning that the house plants receive the perfect amount of water. Plus they also look awesome! Another solution to helping friends and family indulge their green-fingered side during the cold winter months! 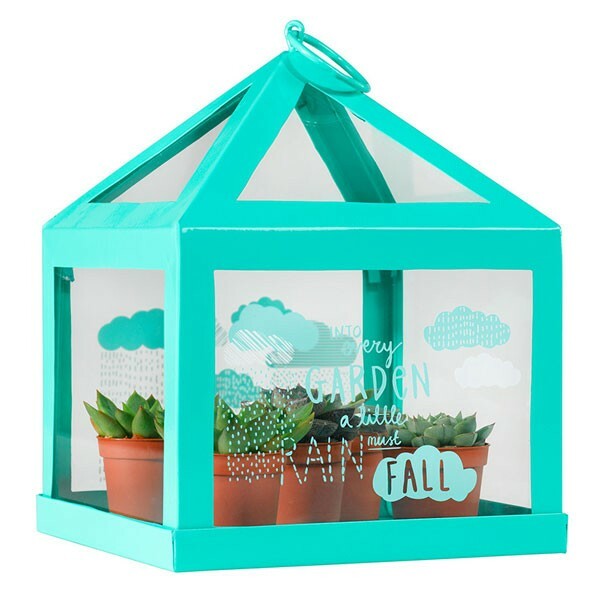 This delightful design is quite literally a scaled-down greenhouse, meaning that the lucky recipient can create the perfect environment for growing seeds to plants, in the comfort of their living room! Help your garden loving friends create a buzz in their garden with this contemporary bee hive! This beautiful bamboo and wooden creation will make a colourful and modern addition to their garden, and is also a great way to help local wildlife! This wonderfully cheerful design is perfect for giving houseplants or kitchen herbs a perfect sprinkle. Featuring whimsical cloud designs and the phrase ‘Into every garden a little rain must fall’ – this modern watering can reminds us that rain isn’t *always* bad, as it keeps our garden healthy! Upgrade your houseplant-loving friends’ old terracotta pots to these funky robot flower pots! The Planter Bots are on a mission to destroy boring flower pots, and will make a cheerful addition to any home or desk space. If you are buying for someone who loves to feed their local feathered friends, but only has a small garden space, then the Bungee Bird Feeder is the perfect Christmas gift for them! Unlike most bungee jump sites, this audacious adventurer can jump from anywhere in your garden! This funky feeder is perfect if you’re short on garden space and can’t accommodate a huge hanging basket-style feeder. Another one for the bird lovers! This quirky tyre swing bird feeder may have a novelty design, but its shape is ideal for allowing your garden visitors to easily reach the seeds by perching on the edge of the tyre. Bright, cheerful and functional, this exclusive hotel for creatures of the six legged variety, would make a delightful gift for wildlife lovers! With stunning attention to detail, including the inner tree rings and bark detail on the edges, the Forest Annual Ring Cushion looks just like the real thing! A lovely decoration for any room, this unusual soft furnishing is a great gift for nature lovers. Click here to view the whole range of gifts for gardeners! And remember to look out for our other eleven gift guides – there will be a new one added every working day until 11th December – see what’s coming up here!